I love Mall of Emirates, that was the first place Sahil took me to. It was my first outing when I came to Dubai some more than two and half years back. In the first week of being in Dubai, I visited the mall thrice. There are many firsts associated with this place, the first movie, the first grocery shopping, the first big splurge, the first coffee date (with the husband of course!) and so on. That’s my go-to place for movies or shopping. On one such tiring shopping spree, we ended up at the first level food court of Mall of Emirates and visited The Indian Pavilion next to Vox Cinemas. It offers good Indian good and the prices and service is pretty decent too. 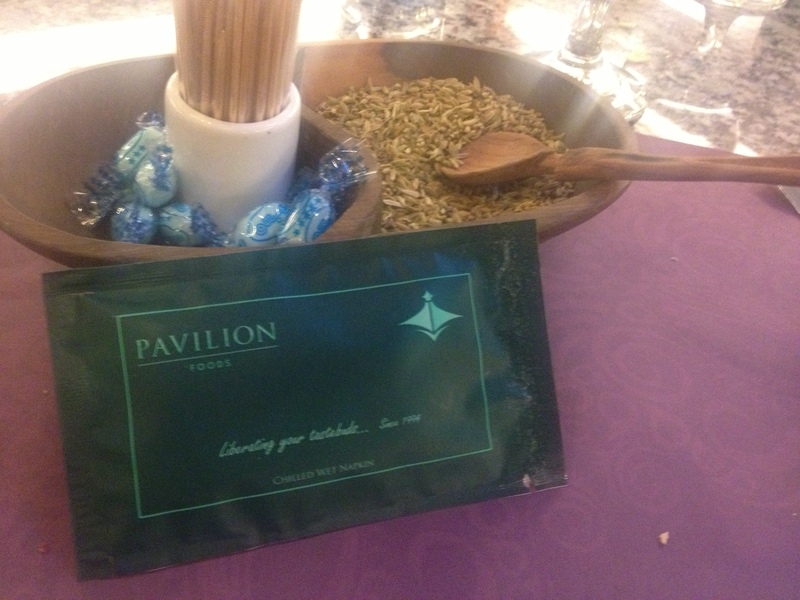 The restaurant provides complimentary fried papas with green chutney and pickle. How nice! Who doesn’t like a good crunchy one! 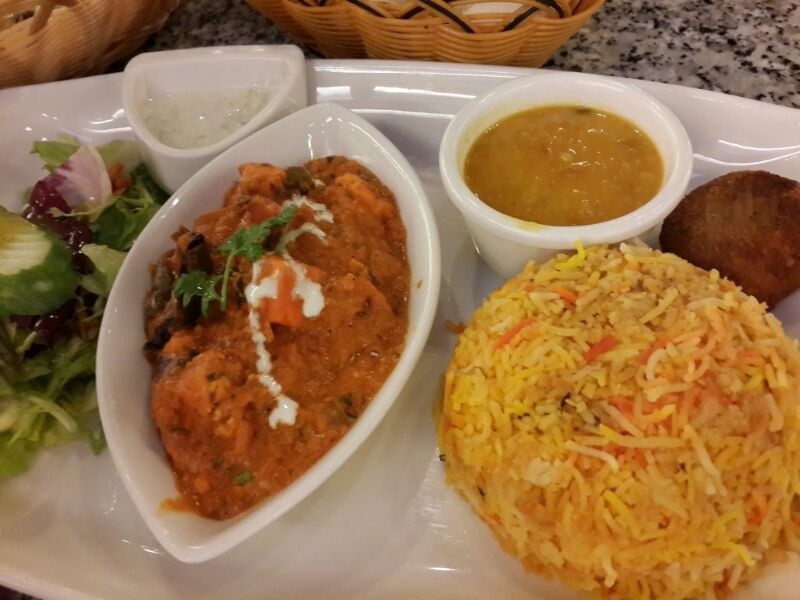 The restaurant has an interesting concept of ordering mains which is a complete meal or a platter in itself. 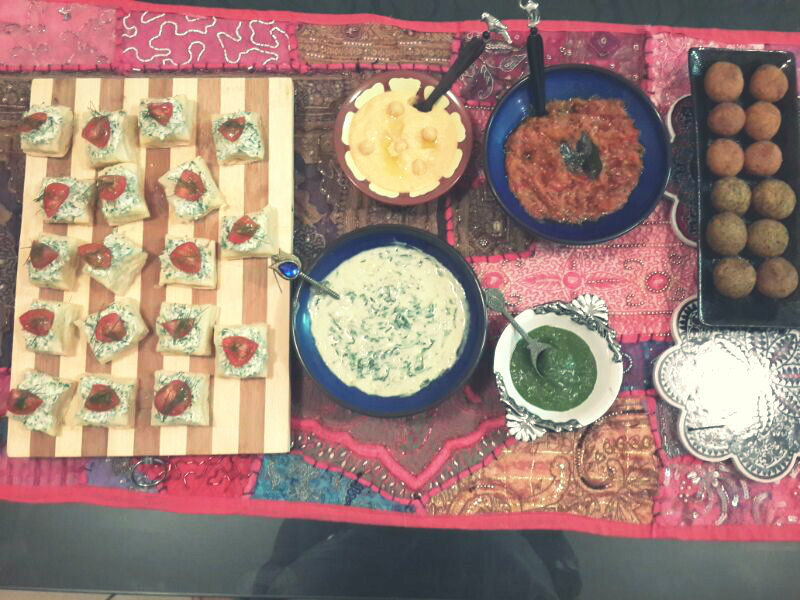 It comes with an accompaniment of roti (flat bread) or pilaf rice, 2 falafels / aloo tikkis (potato patties), cucumber raita, home style split yellow lentils and mixed salad. 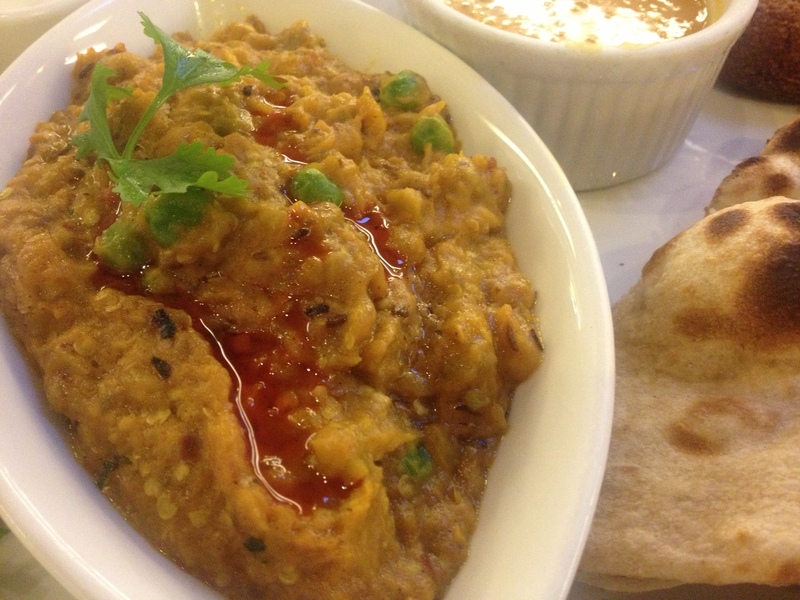 I ordered the Baigan Bharta, it simply means roasted and mashed aubergines cooked with spices. 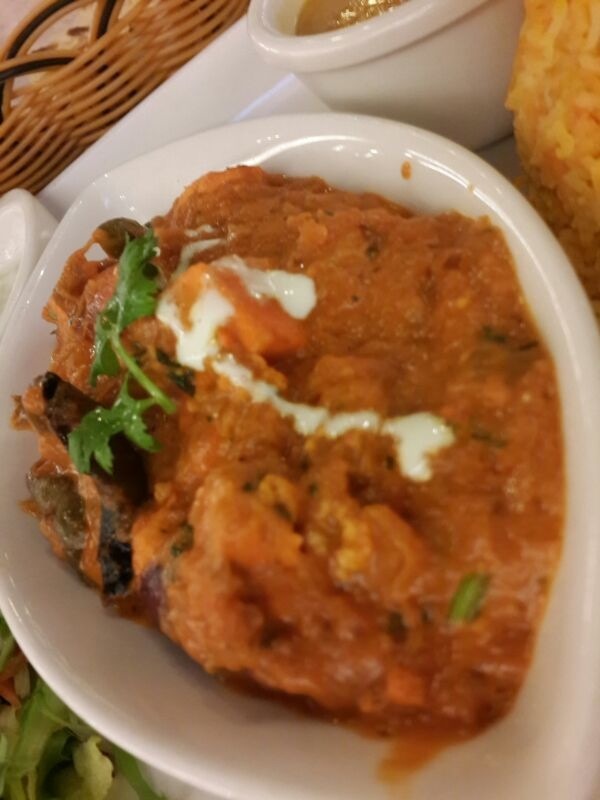 I loved the roasted smokey flavor of aubergine with green peas in onion and diced tomato gravy. 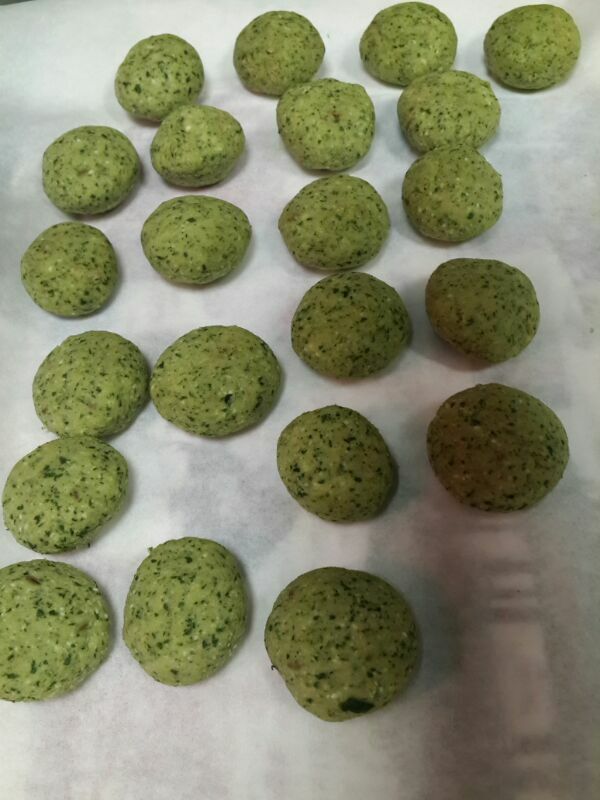 The green peas required to be blanched a bit more, they were quite firm. 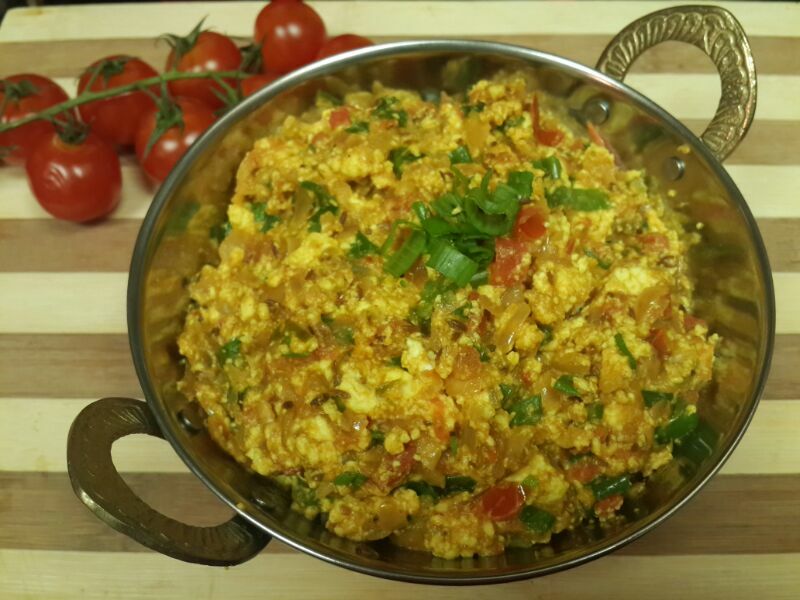 The Bharta cooked at my place by my grandmother used to have more of tomatoes giving it a rich red color but in the restaurant it was with less tomatoes. I liked how they finished the whole dish with red chill infused oil. This was a hit! We also ordered Achari Paneer Mutter, that’s cottage cheese and green peas cooked in a spicy brown gravy of onions and spices. The cottage cheese was slightly tossed on a pan since it had browned on the edges. It was spicy and I loved the heat in the gravy, it was finished with a garnish of coriander and chili oil. 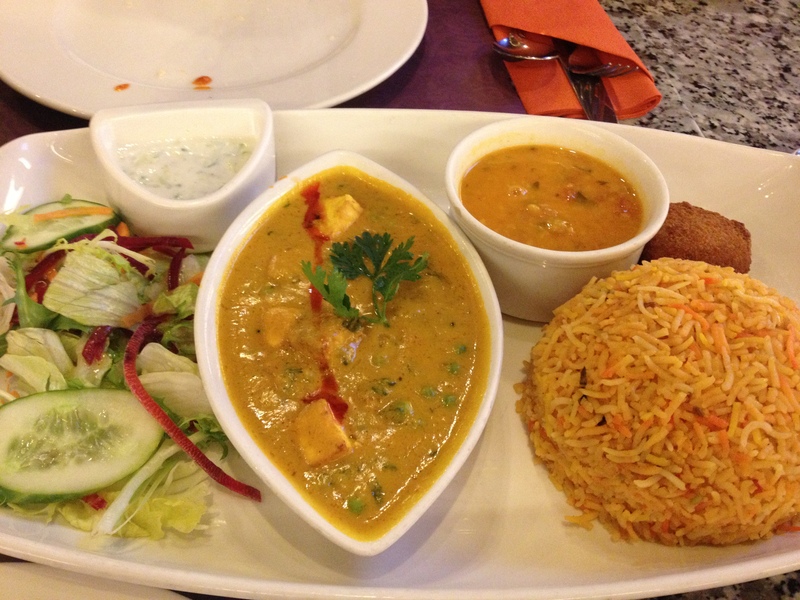 We also ordered Paneer Tikka Masala on one visit, the paneer was soft and the gravy was tangy but not overtly spicy. The red onions, capsicum and tomato wedges were char grilled and we could see the sides browned evenly. I am a gravy person and would have loved if it came with little more gravy. 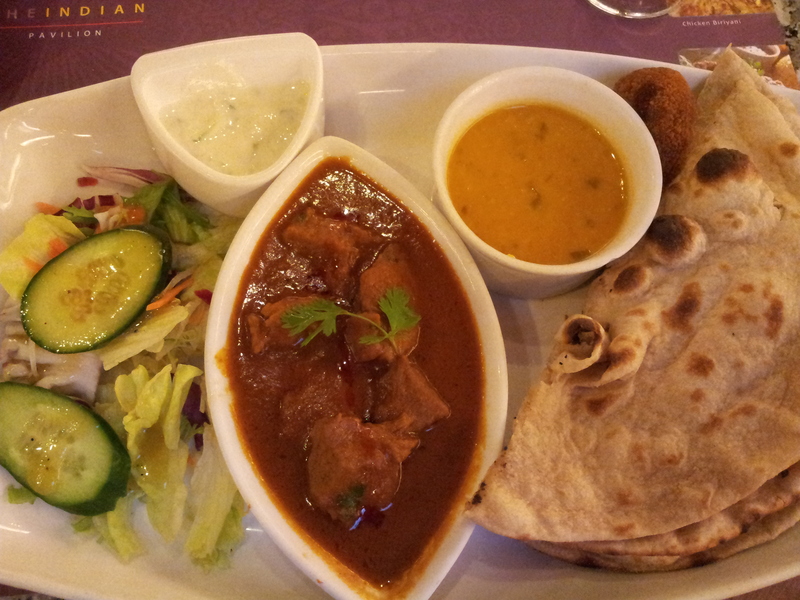 Nevertheless it was a good dish with a side of butter naan. 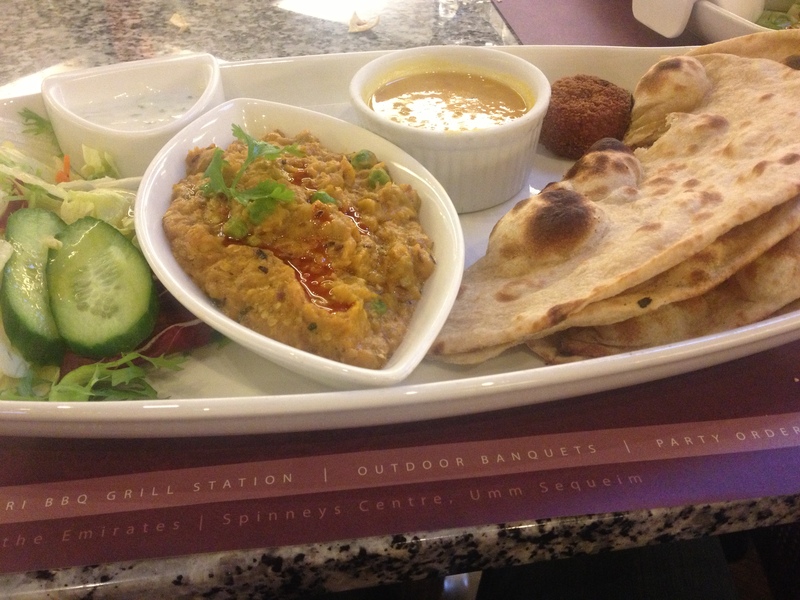 The accompanying pilaf was fragrant and mildly spiced, the dal was the best part of the platter. I can keep going back to this restaurant just for their yummy dal. 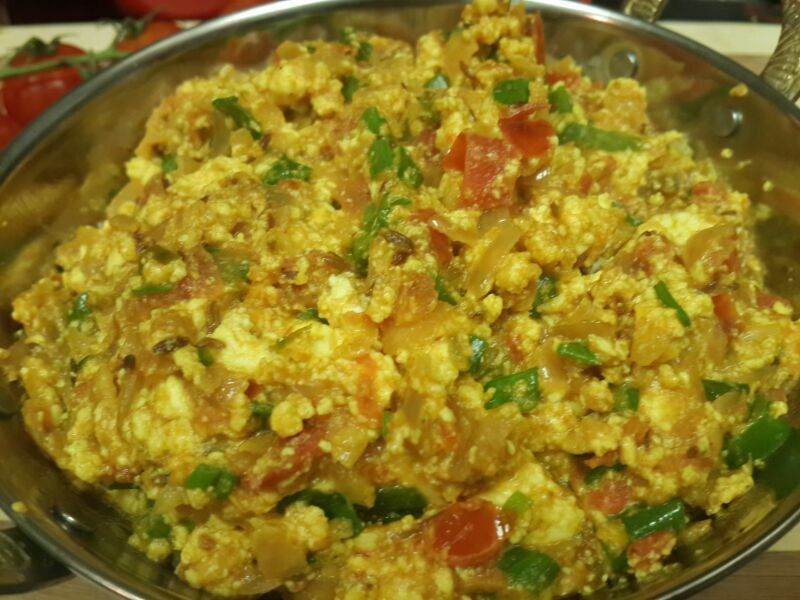 It is perfect home cooked version of split yellow lentils tempered with green chillies, finely chopped onions and tomato. The aloo tikkis (potato patties) served had a nice crust on the outside and were piping hot inside, the mashed potatoes had a strong flavor of roasted cumin. 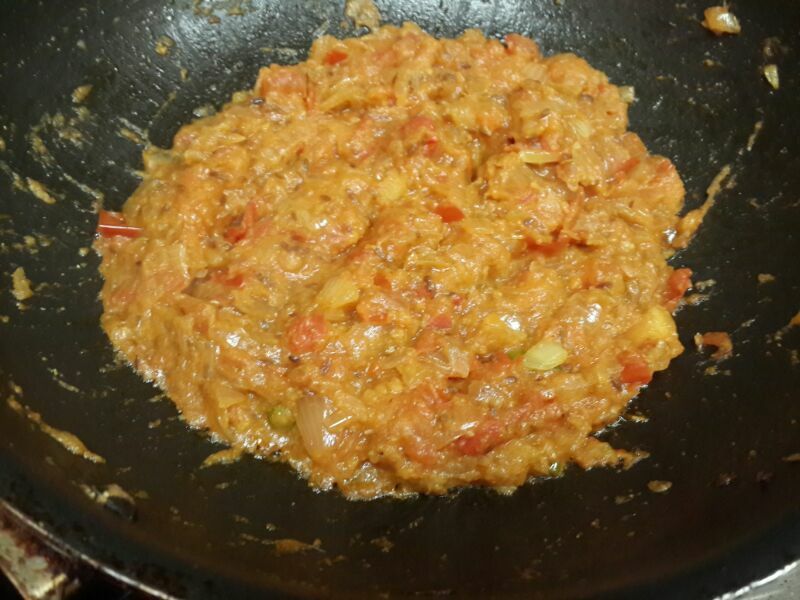 It also had soaked chana dal and grated onions. Mixed salad and cucumber raita provided a refreshing feel to the otherwise spicy platter. Sahil enjoyed his Lamb Madras style, as per him, it was cooked nicely with hot red chilled and curry leaves. But it was quite basic, it was good but that great. Being an ad guy, Sahil loved the packaging of their wet tissues and even clicked it as a reference. He finds them quite fragrant. On a side note, I have also tried their Masala Dosa which was pretty soggy and not up to the mark. The restaurant has consistently disappointed us on it’s desserts. We once ordered Phirni which was served to us hot traditionally it is always served cold and the gulab jamuns they do were quite average hence we keep skipping the dessert order. 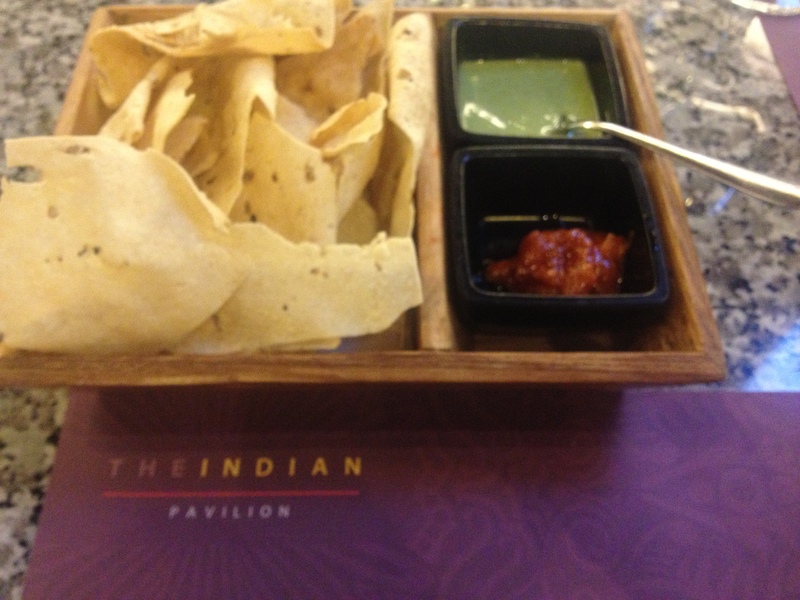 However when in MOE and in mood for good Indian food priced decently, I would visit them for more! Being a Punjabi and a vegeterian to that, Paneer (Cottage Cheese) is a staple in our meals at homes, be it Paneer Kulcha, Paneer Pakoda or Paneer bhurji made in a jiffy. 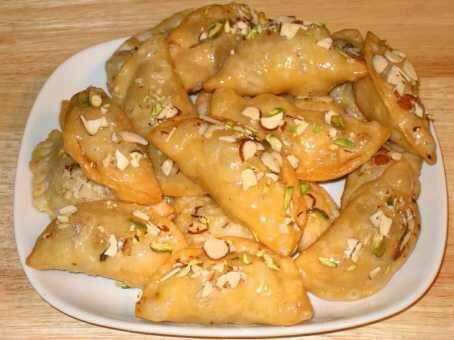 I have adapted this recipe from Chef Vikas Khanna’s “Flavours First”. This book has got simple wholesome recipes using everyday ingredients. 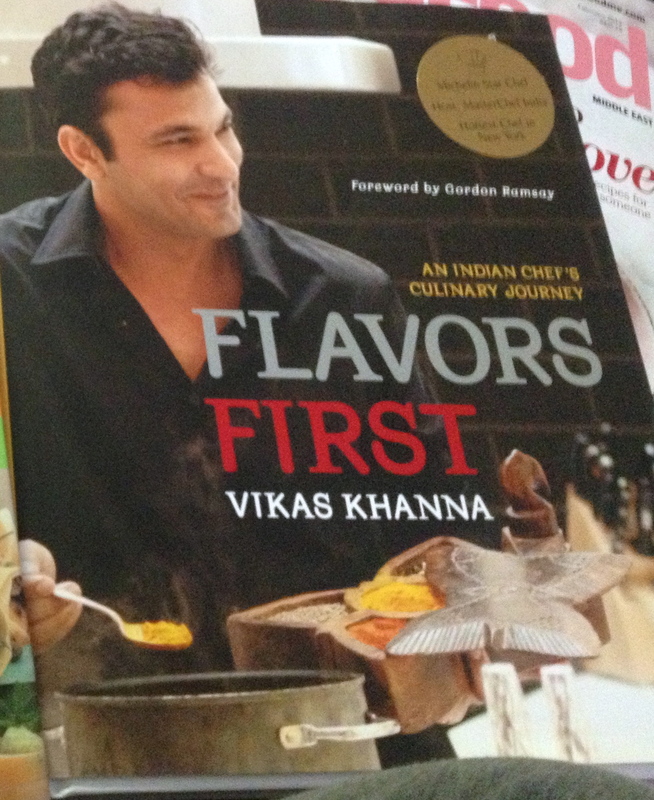 Now I doubt that someone would have not heard about Vikas Khanna, however to just brief you. He is the poster boy of Indian cooking abroad. He is a Michelin starred chef who heads Junoon Hospitality based in New York. He has cooked for the US President umpteen times on invitation and also hailed as the “Sexiest Man Alive” by People Magazine. He is a judge on Master Chef India and I must say his boyish charm and down to earth nature, make him a delight to watch. I especially loved his series “Holy Kitchens” wherein he explored the food sharing traditions of various religions. Here’s more on him from Wikipedia if you would like to know about Chef Vikas Khanna and his journey. I like cook books wherein you read a recipe and don’t have to resist the urge to cook right away just because the recipe demands a gourmet or exotic indegrient. Flavours First is one such book, Chef Vikas has enlisted his family recipes handed over to him by his Biji “grandmother”. The reason I was able to connect with his food philosophy so much was because like him, even my inspiration happens to me my grandmother. She taught me how the simple home cooked food can be soul nourishing and if made with love can be tasty. I adapted this Cottage Cheese Cooked with Vegetables recipes from his book when my in-laws visited me in March. It was an instant hit with everyone. 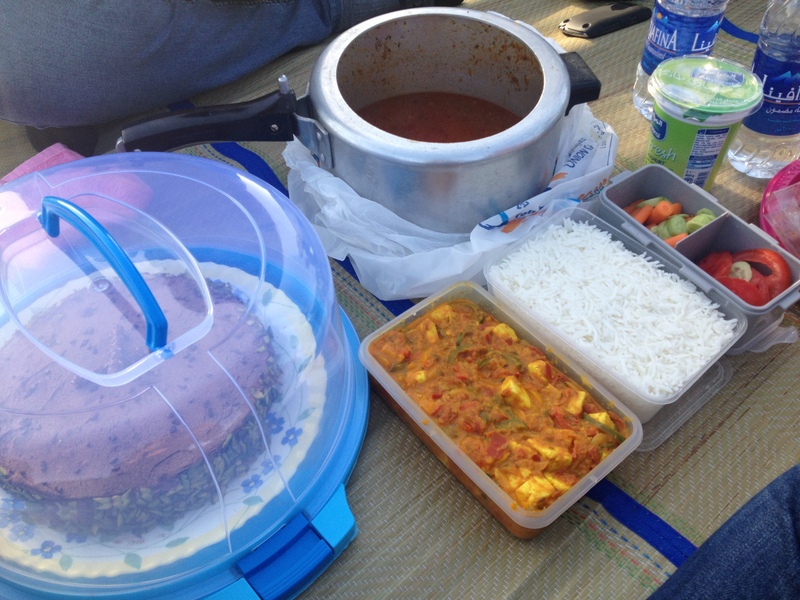 One Friday we all packed our picnic basket full of home made goodies and went to Al Safa park, the al fresco weather in Dubai was perfect and the slight nip in the air made our family get together just perfect. 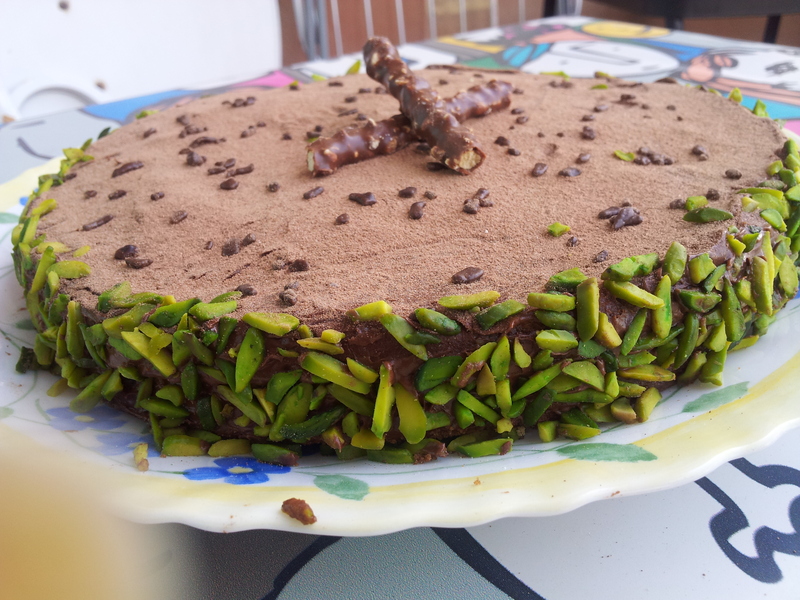 As you can see, we just ate them with Rajma Chawal (red kidney beans stew with steamed rice) and also Vanilla Sponge Cake Coated with Chocolate Ganache and garnished with Pistachios. You see when you got to please a big crowd, you need to incorporate elements to make everyone feel special. 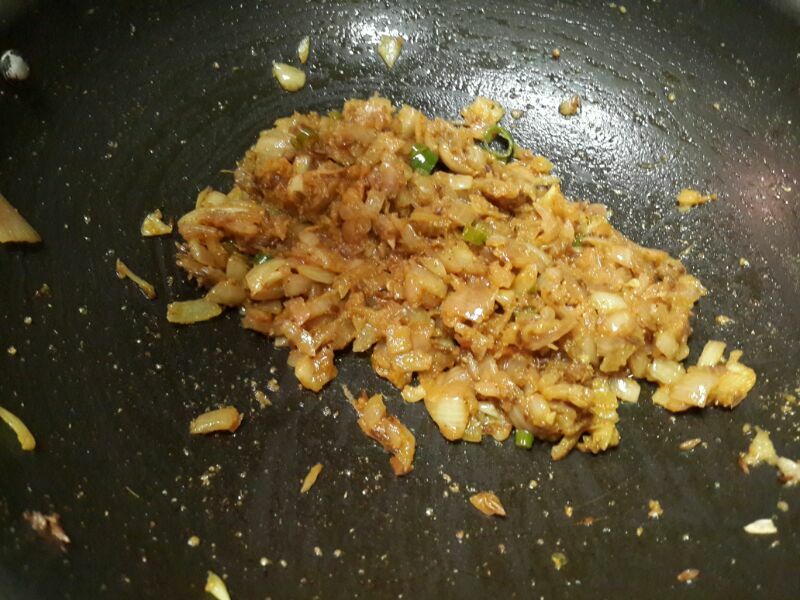 Heat oil in a large wok (kadai) on medium heat, add cumin and let it splutter. Add slit green chillies if you can handle spice. Add ginger and garlic and sauté it well for a minute. Add onions and cook them until they are golden and start to brown. Add tomatoes and cook them well with all the dry spices. Cook them for 2-3 minutes until they are saucy, make sure you don’t dry out the mixture. Add bell peppers and cook until they are soft but not mushy. Keep stirring the mixture, you may add little water if need be. At this point, I added little tomato puree. This is purely optional since I like the red color the puree lends to the veggies. Add paneer at this point. 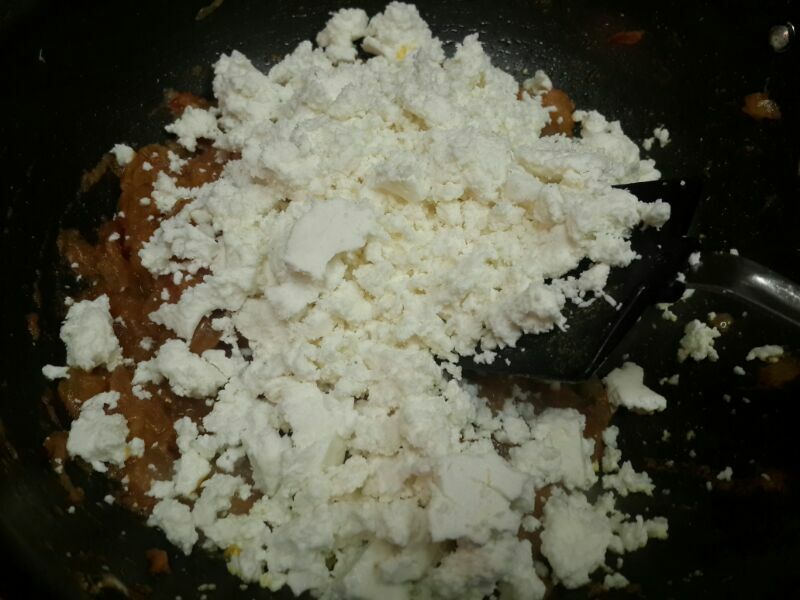 You may shallow fry the paneer before adding it to the mixture. I omitted this since me and familia do not like deep fried paneer. 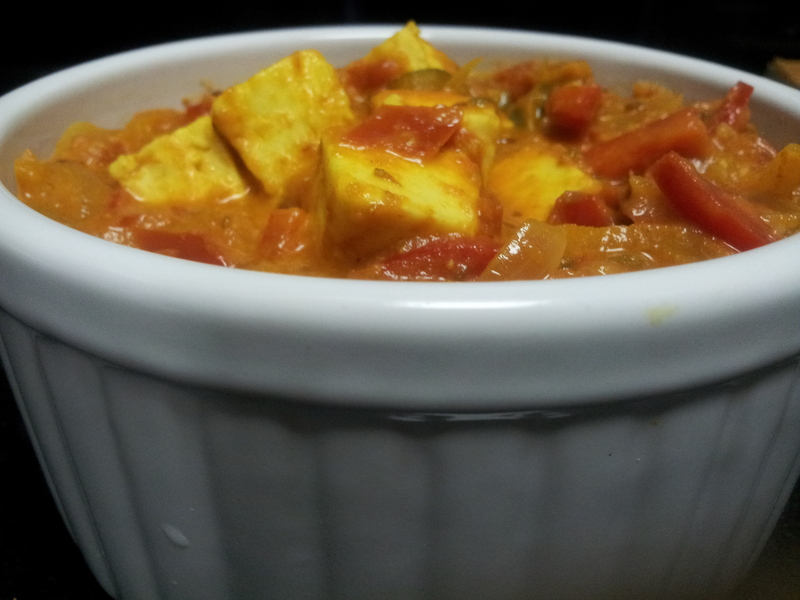 Cook the paneer over medium heat for about 5 minutes. 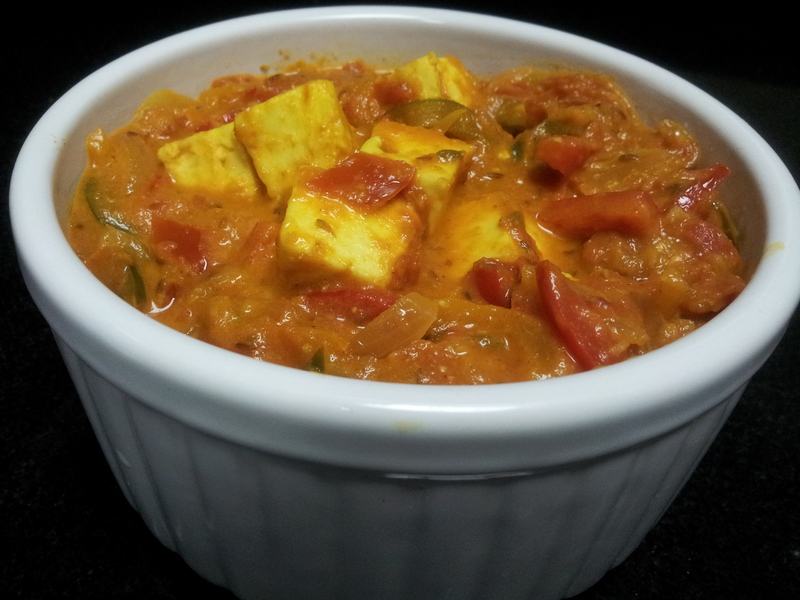 This will enable the paneer to absorb the flavors from the mixture. 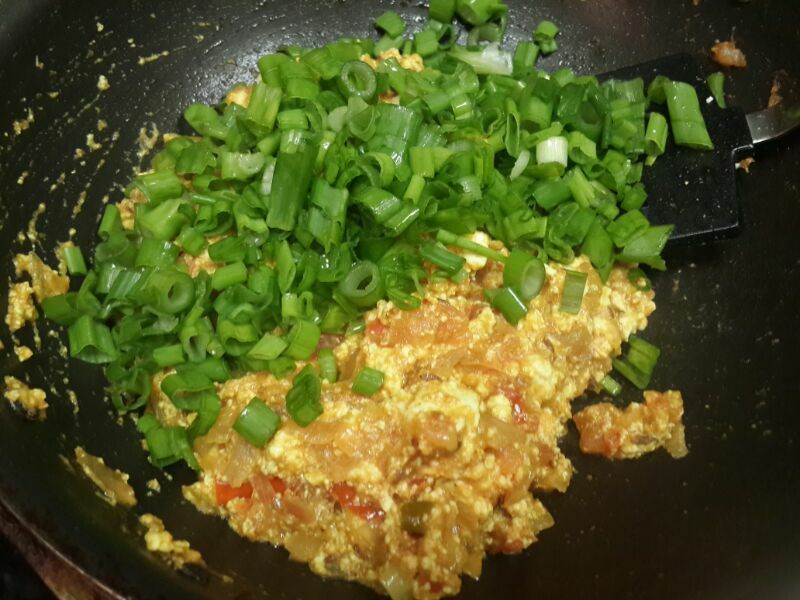 Add the scallions just before you remove the vegetable off heat or mix it towards the end, like I did. Sprinkle with black pepper and it’s good to be relished with hot chapattis or garlic naans.